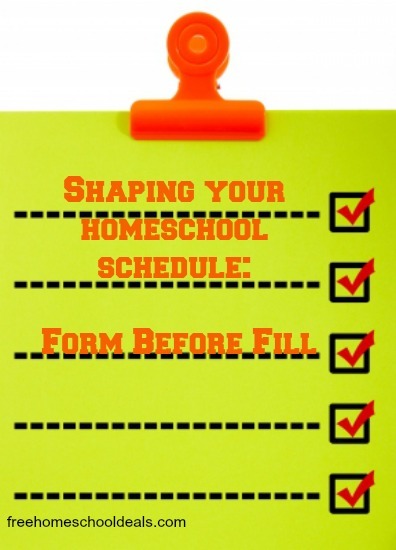 You are here: Home / Community / Shaping your Homeschool Schedule: Form Before Fill! I’ve been a homeschooling mom for almost twenty years, and for so many of those years I filled our lives with too much. Thankfully there was a moment when I stepped back, took a good look, firmed up what I wanted to achieve in our homeschool, and then filled our schedule from there. Want to know where I got that idea? Genesis 1. We are made in the image of God. As homeschooling moms, we shape, form, and create our homeschooling world. In order to succeed we have to ask the right question. Not, “What do I need to do?” Rather, “How did God do it?” In the Creation story, God’s wisdom is displayed. First God formed. Then He filled! In the first three days, God “formed.” He established supportive systems necessary for life and man’s existence. He created the heavens and the earth. He separated the waters from the land. He made the stars and sun. He built the framework that would sustain His creation. The second three days, God filled. He filled His created world with plants, flowers, animals, and man. How should you shape your #homeschool schedule? @TriciaGoyer shares her tips! The problem comes in our homeschooling when we FILL our school days before we build structure around our schedules, our work, and our relationships. We make decisions out of emotions or desires without contemplating how they will impact us. Nothing good ever happens by accident. If you want something good to happen, put some structure around it. Read the rest of this post over at Free Homeschool Deals!